If you like good Reggae, this one's for you. 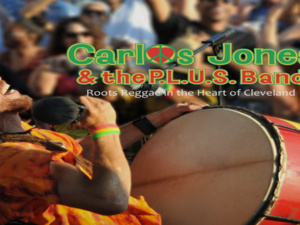 Carlos has been entertaining audiences for over 35 years throughout the eastern half of the United States, first as a member of the roots reggae group “I-Tal”, and then with the legendary “First Light”, before finally pursuing a solo career with his current group – the Peace, Love, Unity Syndicate (aka “The P.L.U.S. Band”). Choosing to focus on bringing a positive message with his music, Carlos has continued to win a diverse group of new fans everywhere he plays. Doors open at 8:30 pm, show at 9 pm. Come get your island groove on!